There are "near", "medium" and "far" infrared rays. The far-infrared rays are the most therapeutic. NASA has used infrared light therapy for years. Asia and Europe are far more advanced in utilizing the infrared sauna for therapy in the health and beauty fields. The infrared sauna benefits can improve health naturally and it is safe to use. It is a radiant heat, using energy to heat the body directly through conversion, without heating the air in between. The FDA has approved of infrared saunas as therapeutic devices. The use of infrared is so safe that they are even used in hospital nurseries to warm newborns. Infrared light therapy deeply penetrate the layers of skin, transforming light energy into heat energy. This deep layer heating causes blood vessels and capillaries to dilate for better circulation. It produces a deep sweat to excrete metabolic wastes through the skin’s pores and is an excellent means of cellular cleansing. The skin is the largest organ in the body and is believed to eliminate up to 30% of body waste. Infrared light therapy helps to purify the skin and clean the pores bringing great amounts of nutrients to be carried to the skin. The increased blood circulation promotes healthy skin. This helps clear up such conditions as eczema, psoriasis, and acne. A healthy body is usually very efficient in releasing unwanted products from the body. However, the body does have a hard time eliminating some things, like heavy metals. When toxins are present in our body, blood circulation is diminished and cellular energy is impaired. The body's immune system becomes inhibited, which makes it difficult to fight disease. When infrared heat is applied, the large water molecules in the body vibrates breaking down toxic gases, like sulfur dioxide, lead, mercury and chlorine. The encapsulated toxic materials and gases are then released. Another condition that infrared sauna benefits is clogged capillaries. The heat expands the capillaries and skin pores to expel the toxins from the body. One can tolerate and even enjoy infrared heat for longer periods of time than the heat from a hot tub or steam bath, therefore the sweating from infrared heat promotes the most beneficial detoxification. Far-infrared sauna therapy is effective at removing heavy metals, such as mercury, aluminum and even nicotine, alcohol, ammonia, sulfuric acid and other environmental toxins. If these toxins aren't expelled immediately, they will become stored in the body, sometimes triggering illness. When toxic gases such as sulfur dioxide and carbon dioxide, or potentially fatal heavy metal toxins such as mercury, lead and chlorine, meet large water molecules, they are encapsulated by clusters of water and trapped in the body. Where these toxins are accumulated, blood circulation is reduced and cellular energy is impaired. However, when the infrared sauna light wave is applied to large water molecules, the water begins to vibrate. This vibration reduces the ion bonds of the atoms which are holding together the molecules of water, the smaller molecules are then able to be released through sweat, taking the unwanted metals or gases out of the body with it. One study done by American researchers showed that the sweat released by users of an infrared sauna was different from the sweat of people using a conventional sauna, or even that produced during exercise. “The non-water portion of sweat released in a infrared sauna was cholesterol, fat soluble toxins, toxic heavy metals, sulfuric acid, sodium, ammonia and uric acid." - Dr. Kyuo, Japan. "Detoxification from fibromyalgia and chronic fatigue syndrome: Randy Gomm in Vancouver, became a distributor of infrared saunas after his life was turned around by detoxification. As a firefighter, his health had begun to deteriorate until he was no longer able to work. He was diagnosed with fibromyalgia, and eventually it was realized that the root of his problem was toxic overload from occupational exposure. During the eight years he was ill, he says, he had a lot of time to research alternative modalities to regain his health. 'I discovered that leading researchers in fibromyalgia and chronic fatigue syndrome stated that their patients had high toxic loads," says Randy. "When their loads were reduced, their symptoms often improved dramatically. It worked for me. Detoxing really helped put me back on my feet.'" The infrared sauna benefits include vascular dilation of peripheral blood vessels, bringing oxygen to muscles, joints and extremities. This helps bring relief of arthritis and joint pain, stiff muscles, and soft tissue injuries, including muscles, tendons, or ligaments. It is especially helpful for promoting faster healing and muscle recovery after hard sporting events, or workouts. Studies indicate that it can also have a direct effect on peripheral nerves, decreasing inflammatory conditions such as arthritis. The Journal of Clinical Rheumatology states that the use of an infrared sauna benefits patients with rheumatoid arthritis and ankylosing spondylitis, reducing pain and stiffness. The pain relief mechanisms may include reducing muscle spasms and relieving ischemia due to impaired circulation. They may also include improving oxygenation of the tissues. Infrared sauna benefits the hypothalamus by stimulating it. The hypothalamus controls the production of neurochemicals involved in such biological processes as sleep, mood, pain sensations, and blood pressure. Cardiac improvement can be seen in congestive heart failure with infrared sauna treatment. Improved circulation helps improve high blood pressure, sciatica, hemorrhoids, and varicose veins. Infrared sauna benefits the maintenance of healthy levels of stress hormones, like cortisol, thus leading to relaxation, better sleep and an overall feeling of being refreshed and rejuvenated. In another article published in 1994 in Respiration, authors found “sauna therapy can help respiration in patients with asthma and bronchitis, and lung function was improved in patients with COPD”. Effects that result from infrared sauna treatments occur in two phases. In the first of these phases, the body temperature remains at basal level and sweating is light. The body is able to dissipate the extra heat by increasing circulation and shunting blood to the skin, resulting in sweating. Body temperature does not rise in the first phase. Phase one effects include inhibiting the sympathetic nervous system, inducing sweating, relieving pain, reducing heat production, improving oxygenation and dilating peripheral blood vessels. It also relieves internal organ congestion, relaxing the muscles and enhancing the flexibility of tendons and ligaments. During the second phase, after 10 to 30 minutes (depending on the person), the body can no longer dissipate the heat of the sauna. Your body temperature rises. The blood is more forcefully shunted to the surface. Heart rate and sweating increase. You might feel slightly feverish, light-headed, with labored breathing. You might feel tempted to get out at this point. You don’t need to unless these symptoms go over the "slight" range, or your discomfort is too much for you to handle. Please, if you have any medical conditions ask your doctor before you attempt to use infrared therapy. Always be on the safe side. Many people have a low body temperature and, for this reason, cannot get rid of chronic infections. Common sites of infections are the sinuses, ears, eyes, bladder, throat and intestines. Heating the body helps to get rid of these infections. 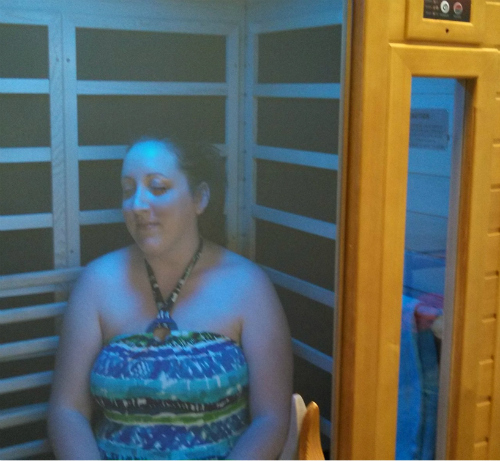 Some of the greatest infrared sauna benefits occur during the second phase of a session. The body begins to heat up. The increased body temperature hastens the death of weaker cells. Weak cells include cancer cells, bacteria, fungi or parasites, virus infected cells, those with damaged DNA, cells with radioactive minerals, toxins and heavy metals, or defective cells. Phase two further increases heart rate and circulation. It will directly disable pathogenic microorganisms, helping clear up foreign material in tissue. It helps to remove cellular debris deposited in fatty tissue that has escaped from blood vessels. During the second phase, the infrared heat therapy is creating a "fever", which stimulates the body's healing process. Infrared light therapy is perhaps the most effective and efficient method of prompting a state of "heat therapy". A typical sauna session will cause a brief (and minor) increase in body temperature, identical to the body's defense mechanism in eliminating foreign pathogens, bacteria, microbes, and infection. The beneficial side effect of this induced temperature increase is immune system improvement, resulting from increased production of white blood cells (leukocytes) by your bone marrow, and killer T cells by your thymus. Heat therapy also helps to kill abnormal cells in the body. Tumors for example do not tolerate heat very well. The increased heat hastens cell death of tumors. This is not a conventional method that is used much, but is beginning to be thoroughly researched. The heat also kills cells mutated by radiation. A 30 minute sauna session can help you burn up to 600 calories, equivalent to 30 minutes of rowing. Infrared sauna sessions will get your heart beating faster and that burns calories. It is a great alternative to physical exercise for those who cannot physically exert themselves. What this technology is shown to do is to raise your metabolic rate for up to 2 days after using it, a potential big aid in your weight loss program. Heat has been shown to reduce pain sensation by direct action on both free-nerve endings (the most common nerve in the skin) and on peripheral nerves. In one dental study, repeated heat applications led finally to the abolishment of the whole nerve responsible for pain arising from dental pulp. Heat may both lead to increased endorphin production and a shutting down of the "spinal gate", each of which can reduce pain. One of the fastest growing complaints in this country today is carpal tunnel syndrome (CTS). Infrared sauna benefits CTS, as well. CTS is caused by repetitive motion and trauma to the median nerve passing through the wrist. Assembly line workers are particularly prone to the problem. The standard medical treatment for CTS is still surgery, which has a dismal success rate of less than 10%. Dr. Wayne Good, the plant physician at General Motors Flint Assembly, has treated close to 600 patients with far-infrared sauna and achieved positive results in over 70% of patients. He is in the process of submitting his results for publication as further studies continue. Common problems associated with lifestyle and aging, such as hypertension and osteoporosis, headaches and digestive problems, are attributed by some scientists to be the result of excess acidity in our system. The American Medical Journal found that in patients with bone loss, alkalizing their system caused a decrease in the bone deterioration. Their conclusion was that our typical American diet is acid producing. The acids deposited in the blood are often stored by the body in forms of cholesterol, fatty acid, uric acid, and other villains that cause havoc in our system. "Reversing The Aging Process - an Enlightened Doctor's Discovery" ©1999 by Dr. Fouad I. Ghaly, M.D. - Studies suggest that far-infrared light stimulates the production of cell tissue and rapidly promotes the regeneration of skin and blood tissue. Let’s not forget that one of the best infrared sauna benefits is simple relaxation. In today’s demanding world, stress reduction is more important than ever. Clearly, more studies area needed, but these are just of few of the potential infrared sauna benefits. The list is growing! Visit Montana Massage to take advantage of the Infrared Sauna Benefits.